Microsoft just held an event in San Francisco — at the Moscone Centre, specifically — and used the time to talk about Windows, bots, Skype, Cortana, and lots more. Speakers included Satya Nadella, Terry Myerson, and Bryan Roper who wore his trademark fedora. Microsoft has been working on some seriously cool things recently and Build was a good opportunity to show them off and, in the process, give some colour to how the company is shaping up under Nadella. Here were the biggest announcements. What it means: The last count Microsoft gave for Windows 10 usage was back in early January when the company announced that over 200 million people were actively using the operating system. Now, almost 90 days later, the figure has risen to 270 million. Why it matters: Windows 10 is free, which means that anyone who has Windows 7, 8, or 8.1 can get it quickly and easily. This is a break from tradition as it means the company makes no money from selling licenses to customers. Instead, Microsoft wants people — as many people as possible — to use its services and buy its software from the Windows Store. Having the maximum number of people using Windows 10 is key to this goal. In the end, Microsoft wants one billion people to be using the operating system. At the current rate of growth, Windows 10 is on track. What was missing: Microsoft didn’t talk about what it plans to do when the free trial ends in July. This could be a problem as users would have to pay for Windows 10 which, in turn, would likely have a dampening effect on sales. What it means: This announcement was hinted at earlier today and was born out at Build: Bots — pieces of software that automatically do stuff, like order food — are something Microsoft is very, very interested in. “Conversation as a Platform” is the new phrase, which was repeated on stage many times. Why it matters: Microsoft is taking an idea that has been around for a while — bots — and making a big, bold bet on them. Bots will now work with Skype, Cortana, Windows, and almost every other piece of software that Microsoft makes, sells, or distributes. For end users, this means that some things get easier: mundane tasks are not automated in most Microsoft-made software. This is also a big deal because Microsoft is one of the first big companies to do something like this — and do something so big. This wasn’t just a small announcement: A big chunk of the time on stage was spent explaining what bots are, why they matter, and where they can be found. What was missing: While bots could be the future, Microsoft did not totally move past Tay. Unfortunately for Microsoft, the company’s future was preceded by a big — and very public — failure. What it means: Apple recently revamped the iPad Pro and claimed that many users were coming from Windows. Microsoft spent a sizeable portion of its time on stage at Build demoing Windows Ink, a new piece of software that looks to pull the carpet out from underneath the Pro’s feet. Essentially, Ink makes Windows more appealing to anyone who uses a stylus by adding new features, like a digital ruler, that could increase productivity. Why it matters: The iPad Pro is a bit of a threat to Microsoft’s Surface tablets — although, perhaps not as much as some people think — and the new features are clearly a shot across the bows for Apple. Microsoft has long positioned the Surface as the perfect note taking device, a pitch that is especially appealing to students, and that continues. Scribbling on a glass surface can, for some, feel like a strange experience but software tools can help reduce the weirdness and get stuff done which, incidentally, is what Microsoft wants. Smart features, like the virtual rule, help this and position the company as the go-to provider paper-like productivity software. What was missing: Ink is cool, but this is an area that Apple does have more experience in having catered to creatives since 1984, when the original Macintosh was introduced. The iPad was not directly addressed — which is unsurprising — but it would have been nice to see a new version of the Surface Pen, to prove the commitment is there. What it means: People who paid $3,000 to get a pre-release version of HoloLens are, from today, going to start receiving their orders. The box, shown off onstage, looks cool and the device appears to work well — although Microsoft stressed that it was not to be considered as the final hardware. Why it matters: HoloLens is one of the most exciting things Microsoft is doing, especially as no other company — not Apple, not Google, not Amazon, not Facebook — has anything like it. 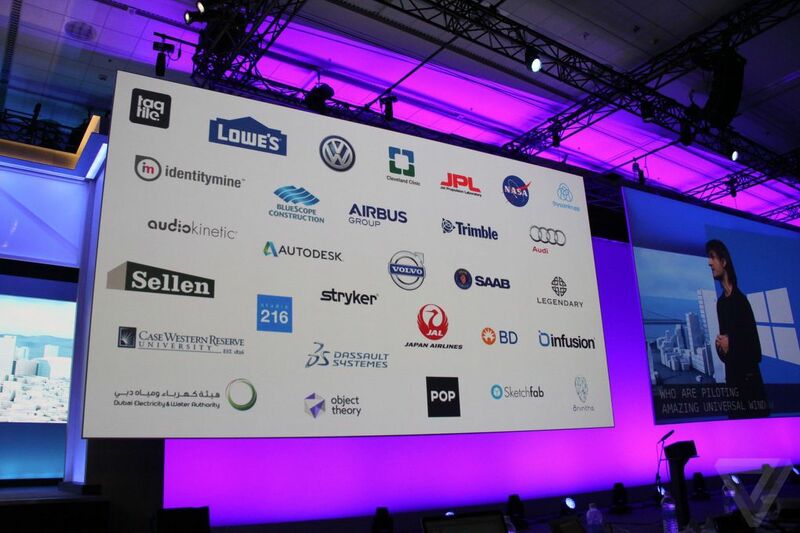 The applications for businesses, who are also Microsoft’s biggest clients, are enormous and the list of current partners includes some other giant companies, like Audi and NASA. What was missing: The demos, while cool, were still a bit pie-in-the-sky and some of the real issues, like depth of field, were largely ignored. There was also nothing particularly new shown off on stage and the only reason it was there at all was because the units are shipping today. What it means: Xbox, which runs Windows 10, is now much more closely associated with the brand and Microsoft as a whole. Apps are now going to be shared across both — which, it’s worth noting, isn’t a new decision — and the two App Stores are going to be combined into one. Why it matters: Windows users in aggregate are going to get a better gaming experience while Xbox will benefit from Windows apps. This, Microsoft hopes, will make everybody happy and is the best embodiment of how well the Universal Windows Platform strategy can work. What was missing: Very little. Microsoft did a good job of summarising why it matters and this is a decision that has been in the works over the past 6 months. What do you think Microsoft's biggest announcement at Build was?